Karen Ann Brzys, of the Gitche Gumee Museum in Grand Marais, MI, offers us this fine example of a Lake Superior Carnelian Amethyst Agate. It’s a beauty. Agates are semi-precious gemstones that are a variegated form of chalcedony (pronounced kal-sed’-nee), which is silicon dioxide in the form of microscopic fibrous quartz crystals. 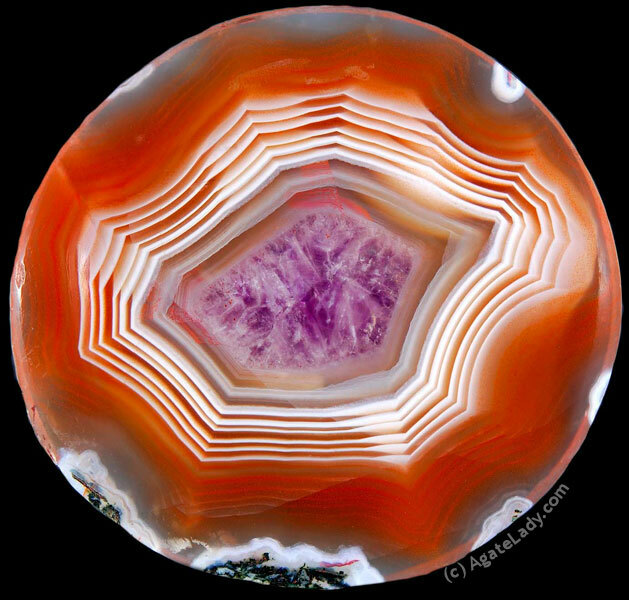 Agates naturally develop when an empty pocket inside a host rock fills in molecule-by-molecule, layer-by-layer as these microcrystals self organize to form concentric bands or other patterns.